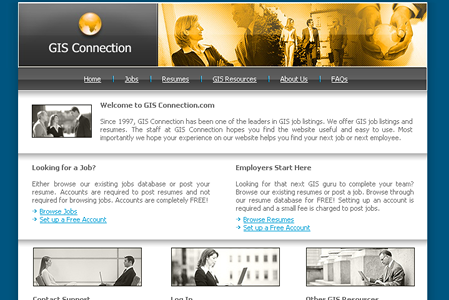 Commercial GIS and geospatial industry recruitment company serving employers and employment seekers. A commercial job announcement and resume posting service for geospatial technology employment. 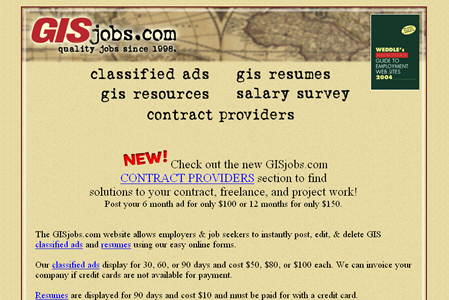 Another commercial job announcement and resume posting service for geospatial industry employment. GeoCommunity Career Center. 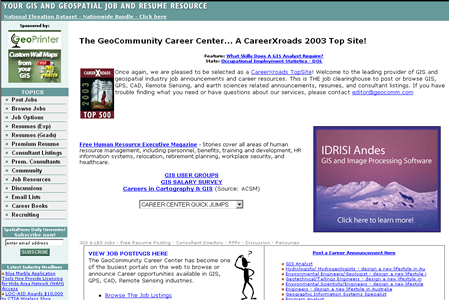 GIS and geospatial industry job announcements and career resources. 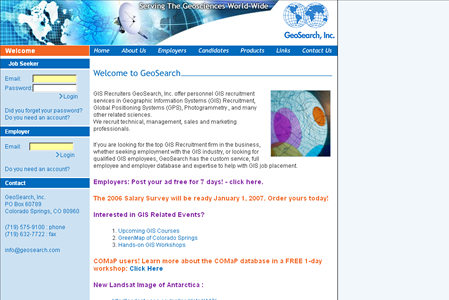 Claims to be the most visited GIS and remote sensing jobs site on the Internet with hundreds of positions and resumes in their databases. You saw all of the job listings and descriptions and you see the potential for the industry as a whole in the article on the right. You are fascinated by geospatial technologies such as Web maps and GPS and you enjoy working with computers and technology. A career in GIS and related geospatial technologies seems worthwhile and exciting but where do you go from here? 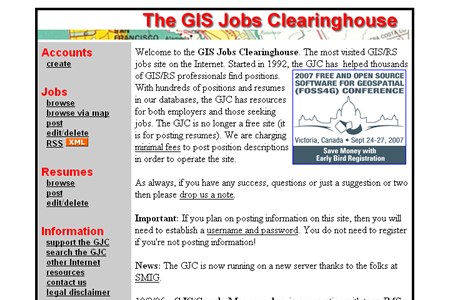 Well, GIS Lounge has a great article on building a career in GIS and the folks over there have some GREAT advice---"start with a solid education." A solid understanding of geospatial technologies takes training, education, and some experience. Scientists who can combine geographic information systems with satellite data are in demand in a variety of disciplines. The market for GIS and related geospatial technology skills, expertise, and education is expanding in breadth and scope. The U.S. Department of labor has identified geospatial technologies as one of the most important emerging and evolving technology areas. The other two fields are biotechnology and nanotechnology. Now, more than ever, education and skills training in GIS and related geotechnologies will become increasing valuable and in high demand.